Lutetium (III) texaphyrin (PCI-0123; Lu-Tex) photosensitizes post-irradiation or "delayed" photohemolysis (DPH) of human and bovine red blood cells at 730 nm. Protection by azide and tryptophan are indicative of a Type 2 photosensitization pathway mediated by singlet molecular oxygen. The photodynamic activity of the unbound Lu-Tex is an order of magnitude higher than the bound component. The DPH rate increases with the approximate 2nd power of the incident fluence for bound Lu-Tex and with the approximate 3rd power when both the bound and free components are present. The DPH rate is accelerated at higher irradiation temperatures with an activation energy of 11 kcal/mol and at higher incubation temperatures with an activation energy of 6 kcal/mol. The DPH curves are analyzed by a multi-hit kinetics model based on target theory which postulates that photochemical damage to the RBC membrane generates initiation sites for cell rupture and that these sites act cooperatively. * A more detailed version of this report will be submitted for publication elsewhere. a Present address: Jordan University of Science and Technology, P. O. Box 3030, Irbid 22110, Jordan. RBC isolated from fresh citrated bovine blood and fresh human blood from a healthy adult male were diluted in pH 7.4 phosphate buffered saline (PBS) to give a light-scattering OD = 2.0 at 750 nm.4 The cells were incubated with Lu-Tex for 90 min at 37°C in PBS which had been pre-treated by bath sonication for 30 min at 25°C. The final RBC concentration was 9.0 x 107 cm-1 for bovine cells and 5.0 x 107 cm-1 for human cells. One set of irradiations were made with the unbound Lu-Tex in the external medium. In another set of irradiations the cells were centrifuged and resuspended two times to remove the unbound Lu-Tex. Spectral measurements showed that > 97% of the initially bound Lu-Tex remained bound to the RBC. The cells were irradiated in a 2 cm x 2 cm cylindrical cuvette with oxygen bubbling and slow stirring while the transmission at 633 nm was monitored with a 1 mW He-Ne laser. The irradiation source was a Quantum Devices Model QBMEDXM-728 multi-element LED (730 nm maximum, 35 nm FWHM) located 3 cm from the irradiation cuvette.9 The on-axis incident fluence rate measured with a Newport Model 835 power meter was 63 mW cm-2 . Hemolysis was negligible during the irradiations. The cells were then incubated with slow stirring until hemolysis was complete. Lu-Tex binding to RBC was measured by incubating the cells with Lu-Tex in PBS for 90 min at 37°C, followed by centrifugation at 1,500 rpm to remove the unbound Lu-Tex, and spectral measurements on the supernatant. 3.2. Delayed photohemolysis: The cells were irradiated at 25°C and incubated at 37°C. DPH was negligible for dark controls and when Lu-Tex in PBS was pre-irradiated for 30 min at 25°C and added to RBC. Figure 1 shows typical DPH curves for 1.5 mM bound Lu-Tex. The dashed lines are calculated with the multi-hit kinetics model. 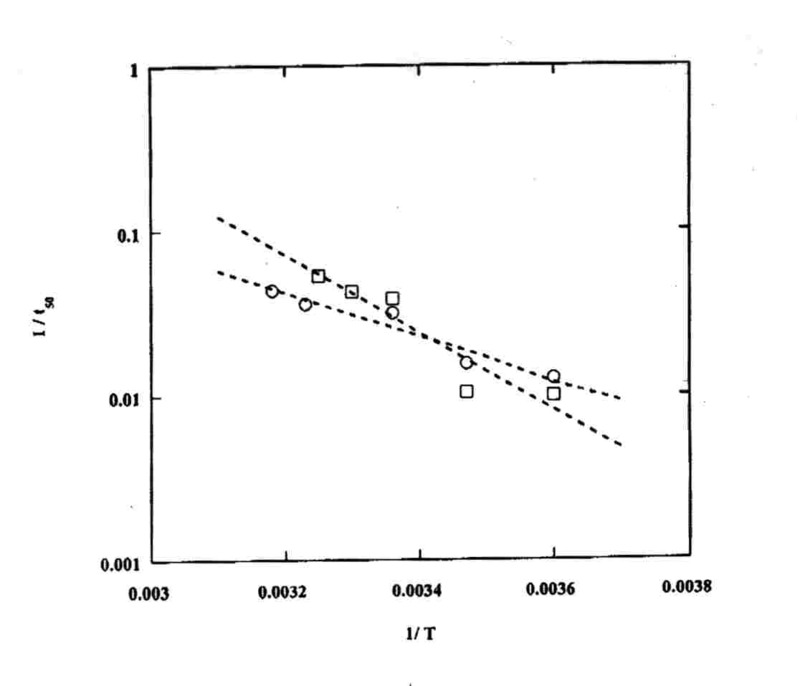 The plot of 1/t50 vs the irradiation time t' in Figure 2 follows Eq. (1) with k = 2.35± 0.11. The measurements with 1.5 mM bound Lu-Tex plus 4.5 mM free Lu-Tex led to k = 2.97± 0.34. Similar results were obtained with 1.2 mM bound Lu-Tex and human RBC. The experimental rate parameters are summarized in Table 1. The results show that k » 2 for bound Lu-Tex and k » 3 when free Lu-Tex was in the system. The average value of S is constant 1.56± 0.05. (Runs with free Lu-Tex present had steeper DPH curves at t50 > 120 min.) The correlation of the rate data with Eq. (1) is shown in Figure 2. The presence of free Lu-Tex led to much faster DPH. Scaling to the relative Lu-Tex concentrations indicates that free Lu-Tex was approximately 6 times more active than bound Lu-Tex with bovine RBC and approximately 3 times more active with human RBC. 3.3. Effect of temperature and additives: The rate of DPH was increased at higher incubation temperatures and higher irradiation temperatures. 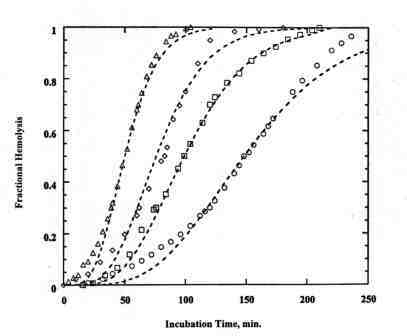 The Arrhenius plot in Figure 3 leads to activation energies of 6 kcal/mol for increasing incubation temperature and 11 kcal/mol for increasing irradiation temperature. The 1Dg quenchers 30 mM azide ion and 30 mM tryptophan (Trp) led to essentially complete protection of DPH photosensitized by bound Lu-Tex and bound plus free Lu-Tex. (1) The model predicts Eq. (1) and Eq. (2) in the limit of low light dose with m » k » j for any value of q. Based on Table 1, the present data are analyzed with m = 2 and q = 6 for bound Lu-Tex and m = 3 and q = 6 for bound plus free Lu-Tex. The value of a is taken as 10.0 min-1 from prior quantitative DPH measurements with PpIX.8 The fitting is very sensitive to q and insensitive to a. The lines in Figure 1 exemplify the good agreement of the model with the data. The average value of b is approximately constant for all runs at 3 x 10-10 min-1 . Bound Lu-Tex parallels other photodynamic agents with k » 2. This result implies that two membrane targets are involved in DPH. The targets proposed for PpIX are the anion channel protein (band 3) and peroxidation of membrane lipids; see citations in Ref.-8. The higher k for systems in which the free Lu-Tex was present suggests that additional targets are available to 1Dg generated in the external medium. Structural membrane proteins are a possible target. Evidence for this damage was found for photosensitization of RBC ghosts by hypericin.10 Additional targets also explain the higher photoactivity of free Lu-Tex compared to bound Lu-Tex. Assuming that the 1Dg quantum yield (FD ) of bound Lu-Tex is comparable to 0.38 in 5% Tween 20 3 and that FD in PBS is comparable to 0.11 in water 1, the free Lu-Tex must be an order of magnitude more photosensitizing than bound Lu-Tex. The parameter m = 2 in the kinetics model specifies the kinetics order of the photochemical stage. Multiple occurrences of photochemical hits leading to hemolysis are specified by q = 6. Thermal activation of the incubation stage is consistent with the model. The 6 kcal/mol activation energy may involve membrane fluidity. The 11 kcal/mol activation energy of the irradiation stage may result from more efficient 1Dg generation at higher temperatures and/or faster 1Dg reactions with the membrane. The "colloid-osmotic" model postulates that photochemical damage to the RBC membrane leads to cation efflux and cell swelling followed by rupture.11-12 Based on the present results, we propose an extension of the "colloid-osmotic" model in which photochemical damage to the RBC membrane also generates initiation sites for hemolysis. 1. A recent study on photosensitized inactivation of lysozyme by Lu-Tex led to the conclusion that 1Dg is only active intermediate.3 The present work extends this primary mechanism to photosensitization of red cell photohemolysis by Lu-Tex. 2. The DPH rate varies with the approximate 2nd power of the incident fluence for bound Lu-Tex and the approximate 3rd power of the incident fluence when the bound and free components are present. 3. The photodynamic activity of free Lu-Tex is an order of magnitude higher than that of bound Lu-Tex. 4. The DPH rate is faster at higher incubation temperatures and higher irradiation temperatures. 5. The multi-hit kinetics model predicts important features of the DPH curves, including the functional form of empirical Eq. (1) at low light dose and the constant relative steepness. 6. Photochemical damage to the RBC membrane generates initiation sites for cell rupture which act cooperatively during dark incubation. The authors are pleased to acknowledge helpful comments by Dr. Tarak D. Mody of Pharmacyclics, Inc. (Sunnyvale, CA) and thank him for providing the sample of lutetium texaphyrin. M.. A.. Renschler, A. R. Yuen, T. J. Panella, T. J, Wieman, S. Dougherty, L. Esserman, M. Panjehpour, S. W. Taber. V. H. Finger, E. Lowe, J.. Engel, K. W. Woodburn, W.-F. Cheong, and R. A. Miller, Photodynamic therapy trials with lutetium texaphyrin (Lu-Tex) in patients with locally recurrent breast cancer, Proc. SPIE, 3247g is only active intermediate.3 The present work extends this primary mechanism to photosensitization of red cell photohemolysis by Lu-Tex. M.. A.. Renschler, A. R. Yuen, T. J. Panella, T. J, Wieman, S. Dougherty, L. Esserman, M. Panjehpour, S. W. Taber. V. H. Finger, E. Lowe, J.. Engel, K. W. Woodburn, W.-F. Cheong, and R. A. Miller, Photodynamic therapy trials with lutetium texaphyrin (Lu-Tex) in patients with locally recurrent breast cancer, Proc. SPIE, 3247 (1998) 35-39. M. A. Al-Akhras and L. I. Grossweiner, Sensitization of photohemolysis by hypericin and Photofrin R, J. Photochem. Photobiol. B Biol., 34 (1996) 169-175. M. Khalili and L. I. Grossweiner, Sensitization of photohemolysis by benzoporphyrin derivative monoacid ring A and porphyrins, J. Photochem. Photobiol. B: Biol., 37 (1997) 236-244. D. P. Valenzeno and J. P. Pooler, The concentration and fluence dependence of delayed photohemolysis, Photochem. Photobiol., 35 (1982) 427-429. A. A. Frolov and G. P. Gurinovich, The laws of delayed photohaemolysis sensitized by chlorin e6. J. Photochem. Photobiol. B: Biol., 13 (1992) 39-50. L. I. Grossweiner,, J. M. Fernandez, and M. D. Bilgin, Photosensitisation of red blood cell haemolysis by photodynamic agents, Lasers Med. Sci., 13 (1998) 42-54. K. W. Woodburn, S. W. Young, F. Qing, D. R. Miles, and P. Thiemann , Light emitting diode versus laser irradiation phototherapy with lutetium texaphyrin (PCI-0123), Proc. SPIE, 2972 (1997) 46-53. V. Senthil, L. R. Jones, K. Senthil, and L. I. Grossweiner, Hypericin photosensitization in aqueous model systems, Photochem. Photobiol., 59 (1994) 40-47. H. Davson and E. Ponder, Photodynamically induced cation permeability and its relation to hemolysis, J. Cell. Comp. Physiol., 15 (1940) 67-74. J. P. Pooler, The kinetics of colloid osmotic hemolysis. II. Photohemolysis, Biochim. Biophys. Acta, 812 (1985) 199-205. Figure 1. Typical DPH curves for bovine RBC and 1.5 (1997) 46-53. Figure 1. Typical DPH curves for bovine RBC and 1.5 mM bound Lu-Tex. 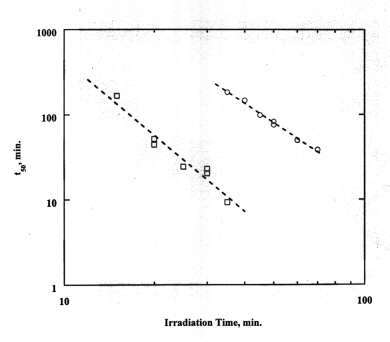 Irradiation times: O, 40 min; , 45 min;  , 50 ; D , 60 min. The dashed lines are calculated with the kinetics model for m = 2, q = 6, and a = 10 min-1. Figure 2. Correlation of DPH data with Eq. (1) for bovine RBC: O, 1.5 mM bound Lu-Tex; ; 1.5 mM bound Lu-Tex plus 4.5 mM free Lu-Tex. Figure 3. Arrhenius plots for temperature dependence of DPH: 1/t50 vs 1/T.  , Human RBC with 1.2 mM bound Lu-Tex irradiated at 25° C and incubated at temperatures from 5°C to 42°C. , Bovine RBC with 1.5 mM bound Lu-Tex irradiated at temperatures from 5°C to 35°C and incubated at 37°C.